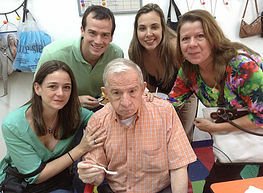 The therapeutic intervention method, for patients affected by dementia, has developed activities directed to the family and professional caretaker. It is an activity that ensures caretakers an interactive environment to promote a proactive and leadership attitude, in both a personal and a technical sphere, for a permanent improvement in the care practices. It is a seminar designed for the needs of caretakers, families, or healthcare professionals in charge of patients affected by Alzheimer's disease or other dementias. The seminar offers the tools to prevent physical or psychological alterations that derive from the caring activities, and it emphasizes in the self-care. It is an activity that takes place in the patient's home, guiding the family core in the handling of the diagnoses' repercussions, conflict resolution, and in the decision making for a better management and life quality of the patient. It is a therapeutic intervention to provide support for the caretakers who may face emotional changes that can come with the caring activities, and to create their support group. It is a beam of hope and empowerment for the caretakers to work on their life's projects. These are leisure and relaxing activities that caretakers need to share their experiences while being caretakers, and to express their emotions.